Lineage. Established as 482 Troop Carrier Wing, Medium on 26 May 1952. Activated in the Reserve on 14 Jun 1952. Inactivated on 1 Dec 1952. Redesignated 482 Fighter-Bomber Wing on 12 Apr 1955. Activated in the Reserve on 18 May 1955. Inactivated on 16 Nov 1957. Redesignated 482 Tactical Fighter Wing on 25 Feb 1981. Activated in the Reserve on 1 Apr 1981. 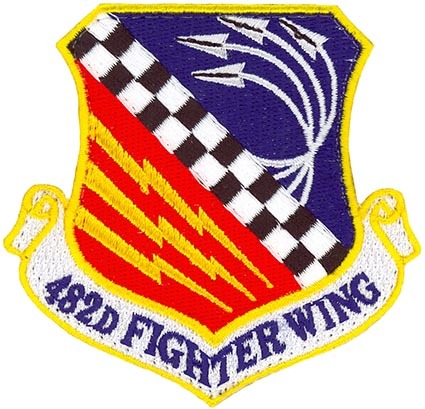 Redesignated 482 Fighter Wing on 1 Feb 1992. Assignments. Fourteenth Air Force, 14 Jun-1 Dec 1952. Fourteenth Air Force, 18 May 1955-16 Nov 1957. Tenth Air Force, 1 Apr 1981-. Components. Group. 482 Troop Carrier (later, 482 Fighter-Bomber; 482 Operations): 14 Jun-1 Dec 1952; 18 May 1955-16 Nov 1957; 1 Aug 1992-. 906: 1 Jul 1982-30 Sep 1994. 924: 1 Jul 1981-1 Oct 1982. Squadrons. 93: 1 Apr 1981-1 Aug 1992. Stations. Miami Intl Aprt, FL, 14 Jun-1 Dec 1952. Dobbins AFB, GA, 18 May 1955-16 Nov 1957. Homestead AFB (later, ARS), 1 Apr 1981-. Aircraft. C-46, 1952. F-80, 1955; F-84, 1955-1957; T-28, 1955-1957; T-33, 1955-1957; F-86, 1957; C-119, 1957. F-4, 1981-1989; F-16, 1989-. Operations. Trained as a fighter-bomber organization, 1955-1957. Received brief training in C-119 aircraft during Oct 1957. Replaced the 915th Tactical Fighter Group in Apr 1981 and trained to maintain tactical fighter combat readiness. Controlled two like-equipped tactical fighter groups at Bergstrom AFB, TX (1981-1982) and Wright-Patterson AFB, OH (1982-1994). Following massive damage caused to Homestead AFB by Hurricane Andrew in Aug 1992, the wing’s flying operations were conducted from Wright-Patterson AFB, Sep-Dec 1992 and from MacDill AFB, FL, Feb 1993- Mar 1994. The 482nd became host wing at Homestead on 1 Apr and provided weapons training support for air force units beginning in Oct 1994. From1997, periodically deployed personnel and aircraft to Turkey to help enforce the no-fly zone over Northern Iraq. Decorations. Air Force Outstanding Unit Awards: 1 Jul 1981-5 Oct 1982; 1 Jan 1989-31 Jul 1990; 2 Oct 1991-1 Oct 1993; 1 Nov 1993-30 Aug 1995; 1 Oct 1996-30 Sep 1998. Bestowed Honors. Authorized to display honors earned by the 482nd Operations Group prior to 26 May 1952. Service Streamers. None. Campaign Streamers. World War II: Air Offensive, Europe; Normandy; Northern France; Rhineland; Ardennes-Alsace; Central Europe. Decorations. Distinguished Unit Citation: Germany, 11 Jan 1944.